At EnV hair lounge & wig center we carry a large selection of hair products. We continually research new product lines to meet the changing needs of our clients. 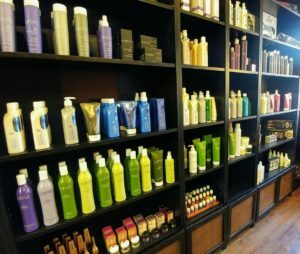 Please visit the salon to see our extensive retail area, where you can find organic, environmentally safe, color safe, and gluten free hair care. EnV hair lounge & wig center also carries multiple color lines. For the client that experiences itching or burning during a color process…Did you know this reaction is a sensitivity or allergy to certain ingredients in color? Make an appointment to try the organic color system we use in the salon. 99% of our clients with color sensitivities or allergies have positive results alleviating their symptoms and continue to enjoy the benefits of their color experience. Why not try it today?